Rakshabandhan is a festival celebrating the sacred, precious and loving relation of a brother and sister, wherein the latter ties the auspicious thread on the former’s wrist praying for his well-being while the brother pledges to love and protect her sister against all the odds, harms, troubles and difficulties. This frail of thread of rakhi is considered stronger that binds the most beautiful relationship in an inseparable bond of love and trust. On the positive note, many city folks feel that this ritual not only strengthens the bond of love between brothers and sisters, but also transcends the confines of the family. 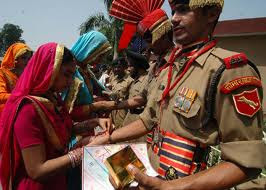 Rakshabandhan festival is celebrated by every Hindu family of Haridwar, Rishikesh & all over India.